As one of the most popular travel destination in the Jamaica and the Caribbean, Negril is home to some of the best available activities including watersports such as diving, snorkeling and much more. Hotels on Negril Beach as well as those on the Cliffs offer unique watersport activities for the entire family to enjoy. 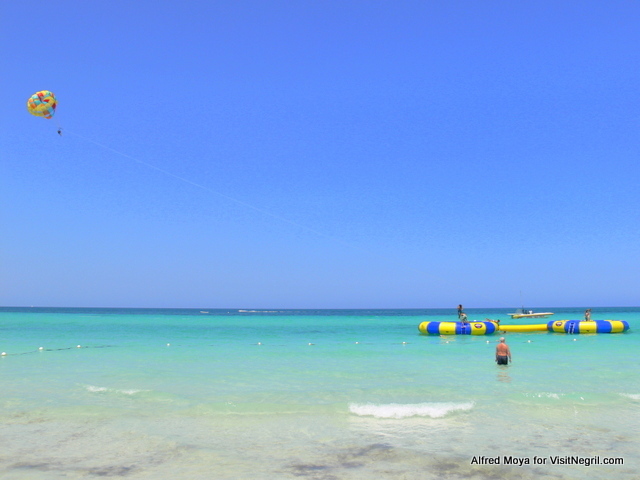 Are you ready for some watersports in Negril Jamaica? Take a ride on a glass bottom boat and gaze through the looking glass into the serene and beautiful under water world, experience the tranquil underwater landscape covered in vibrant colored fish and enjoy a scenic boat ride in the Caribbean Sea. View the ocean as a scuba diving enthusiast would and never have to get wet on a unique adventure on a glass bottom boat rides. Soar above the tranquil marine gardens with a birds eye view through the glass on the bottom of the boat where you'll take pleasure in watching the gorgeous marine life and on some trips you can even feed fish. Right under the surface of the water, the schools of fish and living coral reef seem to be within reach, like they're swimming right below the glass bottom boar. The beautiful coral reef and swirling seagrasses will captivate passengers of all ages. Each boat has a number of glass windows located in the bottom where you'll be able to view all of the wonders of the ocean below you. Ride above a few of the most unique underwater gardens in the Caribbean and take in the natural beauty of a place where you will note the rich hues of the coral reefs, tropical fish and other sea life. Your glass-bottom boat ride offers those who do not want to enter the water an opportunity to witness the scenic views and unique marine life. Watch the vibrant coral reef and sea life of the Caribbean and be in awe as you watch schools of fish swimming by in the clear bluewater beneath you from the safety of a professional guided boat tour. Kick back, loosen up and enjoy the tranquil waters on a glass bottom boat ride in Negril and take pleasure in a panoramic sighting of the nearby coastline and underwater marine life. There are a number of glass-bottom boat operators in Negril and one can be found at any beach hotel. If you take walk down the beaches in negril chances are one of the tour guides will stop you and ask if you want to take a ride. Tropical coral reefs are some of nature’s most diverse ecosystems in the world and they contain many thousands of different species of fish, corals, plants, invertebrates and other microorganisms. The natural beauty of coral reefs draw tourists and divers from all over the world who want to view some of the most beautiful scenes imaginable. Snorkeling in the waters off the coast of Negril is the perfect way to explore the natural world and view the incredible living coral reefs and the large schools of exotic fish that live there. 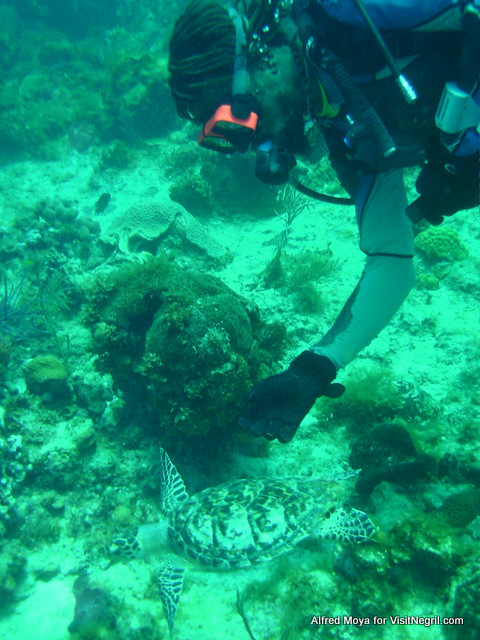 Scuba diving in Negril is a popular it is certainly something the whole family can experience together. While Negril may be famous for its seven mile beach and for picture perfect sunsets is also a perfect location for snorkeling. While a number of small companies along the beach offer glass-bottom boat rides and snorkel trips to the nearby coral reef, there are a few locations in the area that offer the best snorkeling. 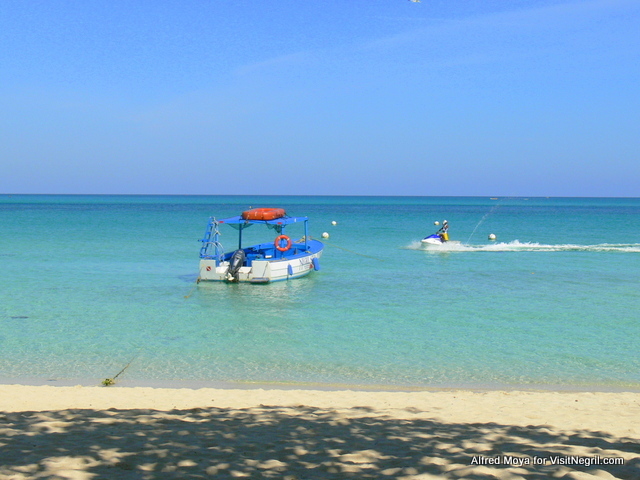 Negril generally has relatively calm seas even when the north coast of Jamaica is rough. If you are looking for something different from the glass bottom boat tours you may consider a snorkel excursion right off the West End Cliffs. A few of the Negril Cliff Hotels offer great snorkeling adventures direct from their location including Samsara, Negril Escape and The Rockhouse to name a few. Each of these locations has vivid coral formations just a short swim from the seaside and makes for a great launching destination for your underwater adventure. Snorkeling on the beach in Negril is certainly possible but not the most ideal situation when you consider that you'll have to swim hundreds of yards offshore before you encounter anything but white sand. At this distance you'll be in the channels where boats and jetski's travel and in danger of getting hit. Parasailing, also known as "parakiting" is a recreational watersport activity where a rider is towed behind a powerboat while attached to a specially designed canopy wing that looks very much like a parachute which is actually called the parasail wing. The boat then drives off and the uplifting breeze will carry the parasail wing and person high into the air. If the boat has enough power as many as two or three people can parasail behind it at the same time. The parascender has little or no control over the parachute which is actually steered by the boat driver. The flight is completed while heading into the wind and your landing will be in the water. The driver of the boat will reduce the throttle speed and the parascender slowly drifts down. The boat will come to a complete stop right before you splashdown to avoid dragging the flyer and parachute through the water. Parasailing in Negril offers a birds-eye view of Seven Mile Beach and is a great way to experience the unique beauty of the coastline landscape. Parasail rides in Negril are available at select locations on the beach and are fun for anyone who can handle the exhiliration of the heights and speed. This adventure is not for the fainthearted or anyone who cannot swim as you will most often land direct in the water and need to tread while the boat driver maneuvers into place. Jet Ski boat rides in Negril are possibly the most popular watersport and just about everyone who visits the beach will be enticed to take a ride on these jet powered personal watercraft. 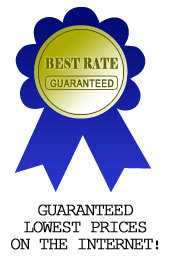 Finding a jet ski to ride will be easy, getting a good deal on one may be a different story. Jet Ski rides can coast upwards of $70 and are surely a great time but be careful of the hustlers who try to short change you on a ride or ask for additional fees for fuel or “tips” upon your arrival. The most reliable jet ski rentals in Negril are located at any of the larger beach hotels and it's worth the wait to find the right price. Jet Skiing is a dangerous sport and requires an understanding of how to handle such a powerful watercraft which can turn rapidly and of course does not come with brakes. Many novice riders have come speeding into the beach only to realize that they have no way to control the speed and they end up ditched on the beachhead and flying over the front end of the bike. Play it safe and cruise into the beach when your time is up and avoid the embarassment and possible fees for damaging the jet ski. Scuba dive Jamaica at its finest off the seashores of Negril and picture yourself gazing out to observe majestic mountains, extensive sandy beaches, world-class golf courses and clifftop bars and restaurants. What better location to experience the wonders of the undersea world, than in Negril where you will discover a paradise for scuba diving and watersports. With seven-mile beaches that stretch to touch the horizon, and sunsets that will touch you to the core, Negril is one of the finest scuba diving locations in the Caribbean. Take a scuba diving trip in Negril Jamaica and visit one of these uniqe underwater attractions. The Throne Room is really a well-lit underwater cave in 65 feet of water, entered through a fissure at the very top. Colorful conduit sponges and shrimps series the wall space, and the site sometimes will be visited through sea turtles, barracuda and even dolphins. The Arches are so known for its coral-encrusted natural arch structures, this deep water dive site is only a few short miniutes from the Negril coast by boat and one of the more popular dive locations in Negril. With a unique selection of coral-encrusted overhangs and numerous small caverns to swim through this dive spot is a popular hangout for nurse sharks which can grow to be as large as 10 ft long and up to 300 lbs. Thanfully nurse sharks are failry docile creatures and they make for a great adventure on any scuba diving trip. Other marine life present at the Arches are yellow-headed jaw bass, both moray and garden eels as well as lobsters. Only Forty five feet deep, the Arches is well within the basic degree limits associated with open drinking water divers. Shark Reef as it has been appropriately named, is another popular dive spot in Negril to see nurse sharks. The reef features a number of overhangs, offering the shelter searched for by registered nurse sharks during the day. Colorful corals decorate the overhangs, and awareness is in the 40- to be able to 50-foot range, which makes it a photogenic plunge site. Base depths at the reef tend to be between Sixty and 70 feet. The Deep Plane sits in about ninety feet water, the is made for more advanced scuba divers. The site is decorated with a rainbow regarding corals and sponges and frequented by barracuda, spadefish and sea turtles. Territorial trigger seafood also are known to inhabit the region, so understand that trigger bass see their "territory" as an upward-facing cone. If one attacks you, go swimming away flat; do not ascend. Jamaica has some of the best deep sea fishing in the Caribbean Sea that is sure to satisfy any level of angler from novice to seasoned professional. Deep sea fishing in Negril is an extremely popular activity among tourist as well as locals alike. Just 15 minutes by boat from the coast are rich waters for deep sea fishing and it will be relatively simple to charter a sport fishing charter boat for a day on the water. Deep Sea Fishermen may catch White and Blue Marlin as well as wahoo, tuna and dolphin in the crystal Caribbean waters. The best time of year for large blue marlin fishing in Negril is in the late summer months and early fall. Jamaica is host to a variety of sportfishing tournaments every year which bring in anglers from around the world who want to compete for the biggest catch. The most well recognized of them all would be the the Port Antonio International Billfish Tournament that is organized in the early fall and offers a hefty prize for the winner. Deep Sea Fishing charters should be reserved in advance by at least a day and the usual fee for a one day charter is about $660 in U.S. Currency. Most fishing charters in Negril will practice catch and release so expect to let your trophy fish go and make sure you bring a video camera with you to record your adventure. No sense is goig home with nothing more than fish tales after your Negril deep sea fishing expedition. 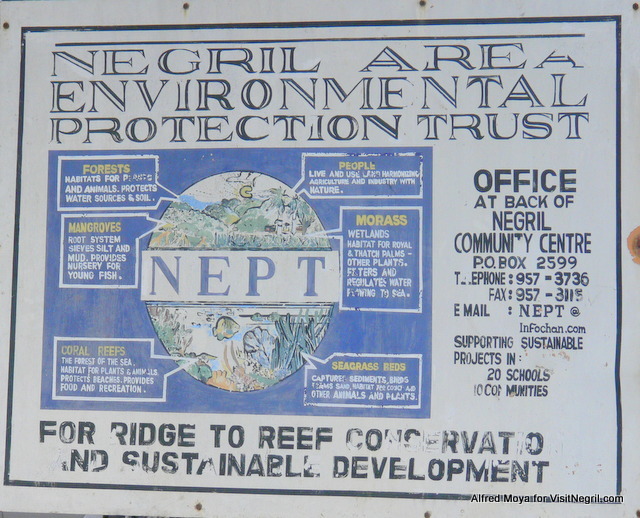 The Negril Environmental Protected Area consists of an area of more than 37,000 hectares which includes a wide range of unique and environmentally sensitive ecosystems such Negril Great Morass, the Royal Palm Reserve, and the Negril River. 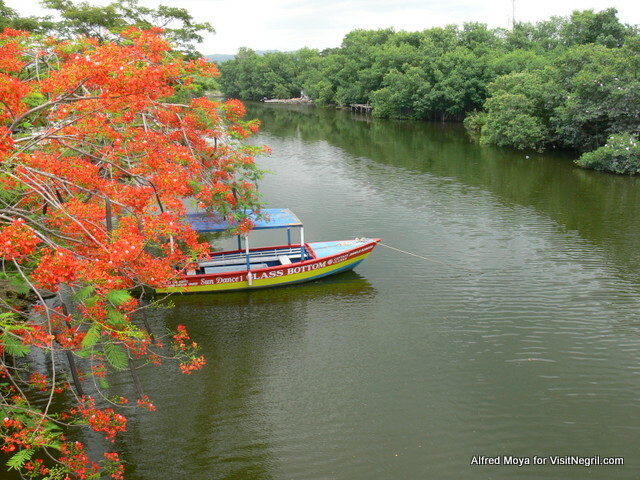 The Negril Great Morass is recognized as the second largest fresh water wetland in all of Jamaica. The Negril Morass is bound by the Fish Water Hills in the east, the Negril Hills which lie to the south, Long Bay Beach and the Caribbean Sea to the west. You can find over 10,000 acres of land in the Negril Morass with the largest section known as the Great Morass consisting of decaying plantmatter which has collected there for thousands of years. The Great Morass holds one of Jamaica's largest concentrations of peat moss which is a very valuable source of energy. Peat mining in the morass has been stopped due to environmental concerns but the issue still comes up on occasion as there is still a great value to this asset. The Negril Environmental Protection Trust (NEPT) is a coolective organization chartered with proteccting the local enviroment that began in 1994 by a number of concerned companies and citizens of the Green Island and Negril watersheds Their primary objective is to protect the local watersheds from pollution affecting the coastal and marine ecosystems. This organization is unique in Jamaica where many other areas are being heavily developed and with little regard to the protection of the environment. Strong influences from foreign interests who want to see the preservation of Negril as an eco destination have allowed the program to succeed where others have failed. The watershed and surrounding areas are great locations for eco-tourism and most of the watersports and related activiites in Negril take place within the watershed. WHAT ARE YOU WAITING FOR? VISIT NEGRIL! More negril beach resorts . More negril hotels and resorts. More Negril All Inclusive Resorts.